The largest UK motorcycle manufacturer - Triumph Motorcycles Ltd has been established in 1984. Triumph Motorcycles have their own individual character and classic design. Today, Triumph's passion and inspiration live in stunning models as Rocket III, Thunderbird, Speed Triple, and Triumph Tiger 800 XC. The company's commitment is a development of really remarkable motorcycles that are distinctive in design and performance. The goal of Triumph is to create motorcycles that offer a great riding experience through the combination of a well-balanced, easy to handle chassis and rigid, flexible engines. Using advanced manufacturing technology and new-generation computer-controlled machinery, the company produces reliable, strong motorcycles delivering great performance. Some of the best-selling motorcycles of Triumph are the 675 cc Street Triple, Triumph Tiger 800 and Tiger 800 XC - great dual-sport motorcycles, which use an 800 cc engine derived from the Street Triple. 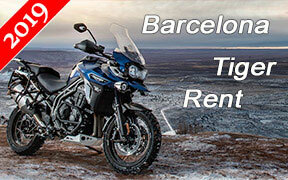 Whether it be sports motorbikes, adventure-, touring- or cruisers, Triumph bikes are those you can always rely on.